Osram Silverstar gives fantastic styling and also increases your cars light output onto the road. The product uses Xenon gas which replicates the HID 'Xenon' systems found on most modern executive cars, this not only gives up to 50% more light on the road, it also makes your car stand out from the crowd. 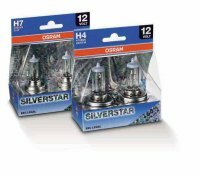 Osram Silverstar Bulbs are directly interchangeable with your cars current head-lamp bulbs. They are made in Germany and are fully road legal throughout Europe. Up to 50% More Light on the road! Objects and situations can be seen clearly at a distance of 75 metres. Service life comparable to that of standard head lamp bulbs. Osram Silverstar can be purchased below in a range of bulb sizes, simply choose your bulb from the options below and 'add to cart' using the buttons on the right. 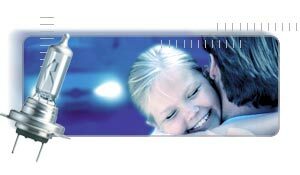 Check out the CoolBlue or the entire Osram Range.